the initial evolutionary step of Homo erectusin Africa to Homo sapiensin Africa was followed by a migration of Homo sapiensover the rest of the world, with the previous local populations of Homo erectusin Asia going extinct (the Replacement Model). We will investigate the evidence for both sides in this very interesting conflict, but first we will look at the earliest remains of Homo sapiensin Africa and the timing of their appearance in other locations throughout the Old World. Skull of Rhodesian Man, East Africa. 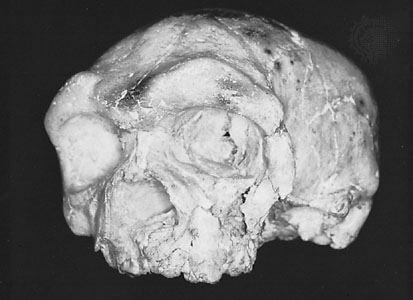 Dates to about 125,000 years ago, and has a large cranium with capacity within the range of modern humans. Thick skull, but modern in shape; chin present, limb bones similar to today’s east Africans. Could be as old as 130 kya. Similar to Omo, also modern in shape; cranial capacity about 1300 cc. Date uncertain, but is at least 125 kya. Bones are fragmentary, but show modern features though fairly large size; fire present. Dates are uncertain, but range from 80 to 130 kya. Robust bones with both modern and archaic features. Date of 100 to 200 kya. In Israel, modern human (Homo sapiens)and Neanderthal bones are found in separate caves only short distances apart. The dates for the modern human remains (Skhul and Qafzeh caves) are both earlier and later than those of the Neanderthals (Tabun and Kebara caves). One of the skulls from the Skhul cave (Skhul V) shows neanderthaloid features in its prognathism and brow ridges, though other skulls from the same site do not. It is possible to interpret Skhul V as evidence for interbreeding between moderns and Neanderthals, though there is no other evidence in the caves for this possibility. It is not known whether the two groups were present in the Near East at the same time, but it is clear that anatomically modern humans predated Neanderthals in the region. The Neanderthals may have come from the north (from Europe), and the moderns may have come from the south (from Africa). The Neanderthals had already been living in Europe for 100 ky, and the modern humans had recently begun to spread from their African point of origin. These sites in Israel represent the oldest evidence for potential contact between these two groups. 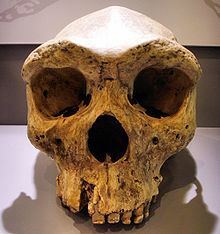 Skull of late Chinese Homo erectus or descendant. Dates to about 200,000 years ago, less than 100,000 years after the classic Peking Man material. Chinese bones dating to 200 kya show “modern features”, suggesting to Chinese anthropologists that there was a local evolution of Homo erectusto Homo sapiens.Chinese researchers thus propose that there is an unbroken line of evolution between the particular Homo erectusin China and the modern Chinese, as represented by the skull from Dali. However, in the Dali skull and in others of the same age in China, there are thick browridges and the skull vaults are low. Thus it is most likely that the 200 kya Chinese fossils represent a continued evolution of Homo erectusto another archaic form rather than the appearance of modern Homo sapiens. By 25 kya there are undoubted modern Homo sapiensin China, most likely the result of immigration in the previous millenia. People probably reached Australia about 55 kya, though skeletal material is not found until 40 kya. The very recent bones from Australia (9 to 14 kya) show brow ridges, receding foreheads, and thick bones, features that would link them with Homo erectusbut for their recent age and large cranial capacities. Old World people entered America at about 12 kya, though some sites have been interpreted to indicate entry as early as 30 kya. In the absence of better dates, human remains, and undisputed artifacts, these early dates are uncertain. it is not disputed, however, that these people were fully modern. The greatest concentration of human fossils in Europe has come from deposits whose dates span the last 130 thousand years. During that time the climate of Europe went through several cool-warm cycles: 130 to 110 kya it was like that of today; 110 to 75 kya it was slightly cooler; 75 to 30 kya it was cool to borderline glacial; and 30 to 12 kya was a full glacial climate. The glacial climate ended abruptly 12,000 years ago. The last 12,000 years have seen smaller fluctuations in climate, most lasting a few hundred to a few thousand years, but none returning to the glacial climae of 20,000 years ago. During most of the glacial period, the Neanderthals were the only human inhabitants of Europe. In fact, they were the only Europeans from 230 kya until 40 kya. Fully modern people arrived about 40 kya and within 5 ky after that the Neanderthals were gone. Some sites (e.g Mladec in Czechoslovakia) have produced skeletons with an apparent mixture of Neanderthal and modern characteristics. In others, the moderns appear alone and with completely modern appearance about 40 kya. The best known of these sites are those from the Dordogne region of southern France. The cave of Cro Magnon gave its name to an entire “race” of moderns though the skulls found there were not typical of their contemporaries, nor of today’s people. The Cro Magnon cave people were taller than today’s humans, with larger cranial capacities (1500 cc, as in Neanderthals).